With the Cartier Tank, we have one of the single most iconic designs in horological history. First, we have the shape of the case, here a rectangle in the traditional fashion, but with the added appeal of steps leading up the case to where it meets the crystal. Then we get to the dial, which is functionally a classic Tank dial, with the painted Roman numerals and rectangular inner track. The major difference here, of course, is in that rich, deep denim blue dial and the golden, patinated hues of the numerals and hands. 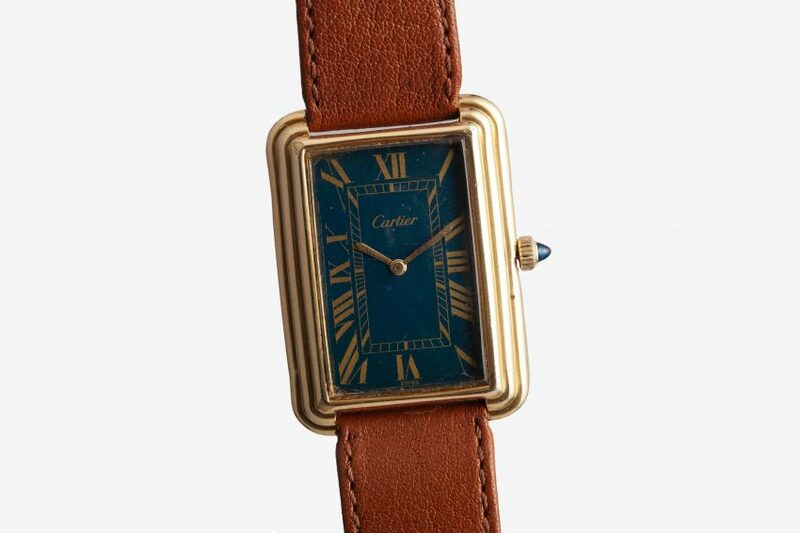 Featuring a manual wind movement, the piece is every bit an icon with a twist, the way only Cartier can do. Case Condition: Good condition, small nick on the right side of the case, below the crown. Dial Condition: Great condition, no stains or patina. Blemishes in photos are from a scuff on the original crystal that can be removed.